Kali's Kitchen: Happy Spring 2016! Spring has sprung, and with it, wonderful new beginnings! I'm also excited to announce my first workshop at Mystical Stone in Stony Plain, Let's Start with Ganesha! With his colorful clothing and elephant head Ganesha is one of the most recognized and beloved deities in any spiritual tradition. 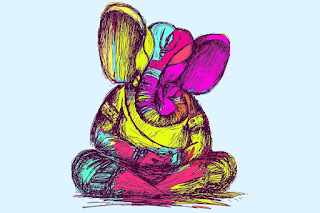 In Yoga he is heralded as the "remover of obstacles" and is saluted before beginning any path of study or new endeavour. Are you ready to make a change in your life? Do you have obstacles you wish to overcome? 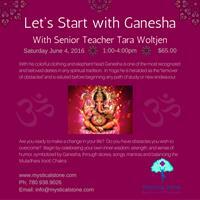 Begin by celebrating your own inner wisdom, strength, and sense of humor, symbolized by Ganesha, through stories, songs, mantras and balancing the Muladhara (root) Chakra. Raja Yoga Summer Camp 2016 is coming soon! This is our fourth year of Wednesday evening gatherings and special events including study nights and field trips to local temples and cultural events. Email at tarawoltjen@yahoo.ca and I will be happy to put you on the e-vite list.